The WordPress Codex kind of complicates things when it comes to creating a child theme. It's actually very easy as long as the parent theme 'plays nice'. You can read the long, complex version here if you want. For ease of explanation, I'll call my template 'template'. So it would be located at /wp-content/themes/template/. The only important line in there is 'Template:'. It should be the same as the name of the folder of your parent theme... in this case, it would be 'template'. Go into the WordPress Administration, click on 'appearence' then 'themes' and select the new child theme you've created and uploaded. Should be good to go. Any template files you want to edit now, you can just copy and paste it inside the child theme folder (like header.php or front-page.php) and edit away. The first step in creating a child theme is to create the child theme directory, which will be placed inwp-content/themes. It is recommended (though not required, especially if you're creating a theme for public use) that the name of your child theme directory is appended with '-child'. You will also want to make sure that there are no spaces in your child theme directory name, which may result in errors. 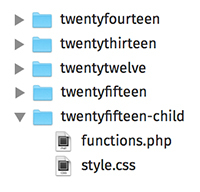 In the screenshot above we have called our child theme 'twentyfifteen-child', indicating that the parent theme is the Twenty Fifteen theme. You will need to replace the example text with the details relevant to your theme. The Template line corresponds to the directory name of the parent theme. The parent theme in our example is the Twenty Fifteen theme, so the Template will be twentyfifteen. You may be working with a different theme, so adjust accordingly. The only required child theme file is style.css, but functions.php is necessary to enqueue styles correctly (below). Note: You may need to re-save your menu (Appearance > Menus, or Appearance > Customize > Menus) and theme options (including background and header images) after activating the child theme. You can also include files in the child theme that are not included in the parent theme. For instance, you might want to create a more specific template than is found in your parent theme, such as a template for a specific page or category archive. See the Template Hierarchy for more information about how WordPress decides what template to use. A child theme inherits post formats as defined by the parent theme. When creating child themes, be aware that usingadd_theme_support('post-formats') will override the formats defined by the parent theme, not add to it. rtl.css is only loaded by WordPress if is_rtl() returns true. It's recommended to add the rtl.css file to your child theme even if the parent theme has no rtl.css file. Child themes, much like other extensions, may be translated into other languages by using gettext functions. For an overview, please see Translating WordPress & I18n for WordPress Developers. Use GetText functions to add i18n support for your strings. To sum up, all strings that use "my-child-theme" textdomain will be translatable. The translation files must reside in "/languages/" directory.